1/13 Sean Collier Very good, and Tarantino's straightest story. 14/169 Max Braden Christoph Waltz is great, but the movie could have been trimmed by a half hour. 21/82 Kelly Metz A bit too 'talky' for some QT fans, but I preferred it to most of his movies. Christoph Waltz and Melanie Laurent were scene-stealers. Finally! The Quentin Tarantino movie we've all been waiting years to see has finally arrived! Okay, no, this isn't The Vega Brothers. 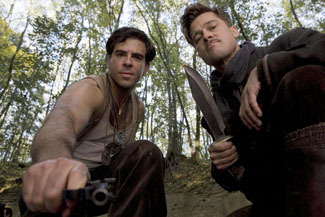 But Inglorious Basterds has been writer-director Tarantino's 'next project' ever since Pulp Fiction fifteen years ago. Inspired by the 1978 Italian-made Inglorious Bastards (Quel Maledetto Treno Blindato), Tarantino set out to write his own World War II special-unit-on-a-mission movie. But this isn't your father's Dirty Dozen. Sleepless in Seattle may have suggested Dirty Dozen as one of the few movies guys can cry at, but in a Tarantino movie you don't cry when the hero dies - you cheer when the bad guy does. And as anyone who's seen the trailer knows, Inglorious Basterds is all about killing Nazis. The story takes place in Paris features characters from the U.S., Germany, France and Britain. Brad Pitt heads up a unit of Jewish-American soldiers whose mission is to bring the fight to the Germans in the dirtiest way they can in order to inspire fear in the enemy. On their mission they come across a French-Jewish girl (Melanie Laurent) whose family was killed by the Germans and is still subject to their torment but finally has a chance at revenge. Most of the featured actors in Inglorious Basterds will be unfamiliar to general audiences by name. American actor Eli Roth has wrote and acted in Hostel I and II, which Tarantino executive produced. Paul Rust is currently starring in I Love You, Beth Cooper. Austrian actor Christopher Waltz plays the top German baddie, for which he won the Best Actor award at the Cannes Film Festival (Tarantino was nomintated for the Golden Palm). Diane Kruger plays a German spy for the Allies. Although Tarantino plays less with the timeline for Basterds than in his previous films, there are still fingerprints on the movie. It is structured in chapters as Pulp Fiction was. And even though it didn't turn out to be epic enough to split into two movies as Kill Bill required, the print that ran at Cannes was nearly two and a half hours long. Also, being into music as he is, Tarantino uses anachronistic songs within the movie. And the spelling in the title? Tarantino bought the rights to the previous Bastards and then changed it to signify his own stamp. Tarantino's biggest box office hit was of course Pulp Fiction, earning over $100 million domestically in 1994. Kill Bill did okay with $70 million for Vol. 1 and $66 million for Vol. 2, but his half of Grindhouse, fun as it may have been, didn't help its box office two years ago. Inglorious Basterds shouldn't be expected to be a huge hit - it's long, assuredly rated R, set in a historical period with only Brad Pitt to sell it, and The Weinstein Company as distributor which has yet to release a movie and bring in $100 million domestically. It's also set for release at the end of the summer season when the box office isn't usually very lucrative. Given the success though at Cannes and the European setting, Inglorious Basterds should have a decent run internationally and see good business when it arrives on DVD. See the latest developments for this project on the Inglourious Basterds Movie News page.